Thanks to automation rules you can make the process of communicating with customers automatic, speed up the sales process, provide your sales team members with already prepared leads and respond individually to contacts behavior on your website. 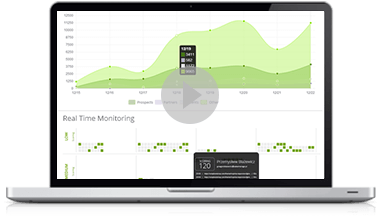 You can use the action: Send web push notification to make your marketing campaigns even more attractive. If a person has resigned from receiving marketing content (has become an opt-out contact), you are not able to deliver messages to their email address anymore. It is possible that the person is still interested in buying your products but simply does not read messages. Create a rule: if a person visits a website and is opt-out at the same time, send a web push notification. If you also redirect such user to the landing page containing a contact form, you can easily convert them from opt-out to opt-in. There are many strategies to rescue an abandoned cart. 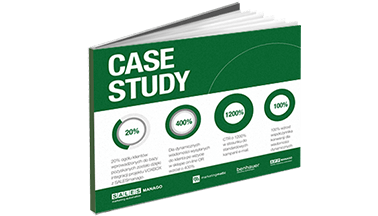 A standard one is to send such a person a dynamic email, however, you can also send a web push notification with a message that a 30% discount is waiting in their inbox. After they have seen such a message, they will come back to shopping more eagerly. Win-back campaigns aim to reactivate a contact that has recently become passive. For example, when you notice that a contact has not visited your website for 30 days, send them a web push or an attractive rich push containing information about the newest offer. 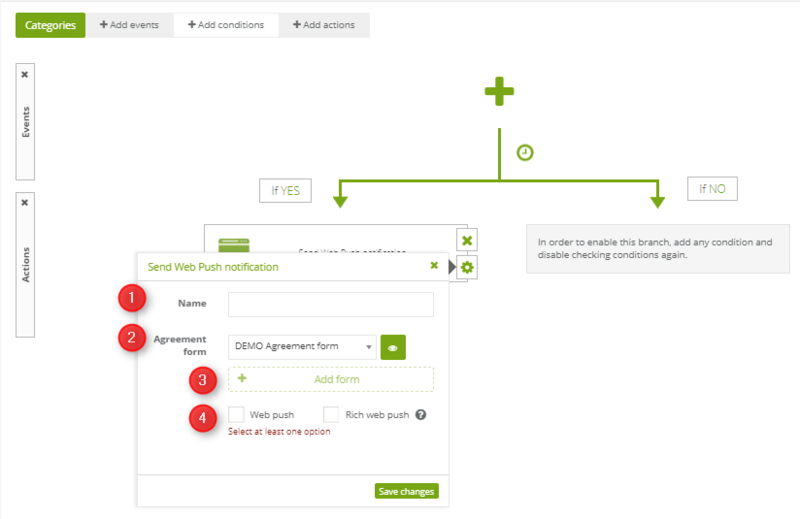 By using the action Send web push notification you can automatically send both Web Push and Rich Web Push notifications to the contacts who meet the conditions specified in the rule. On the list of Actions, find Send web push notification. Then click Options to create a notification and set up the action’s details. Because web push notifications are by nature short and concise, creating one takes only a few minutes. In this case, you can create a new notification right away in this action’s Options. Name – enter the notification name. Agreement form – select a proper agreement form in which contacts can agree to receive notifications. You can also preview the selected agreement form by clicking the icon with an eye. 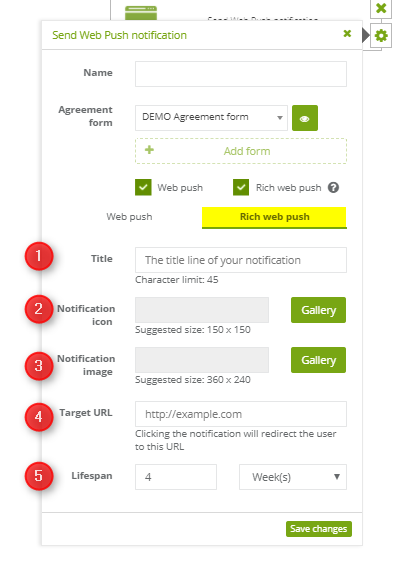 IMPORTANT: Only one agreement form may be active on one URL address, so you need to select the same agreement form for both Web Push and Rich Web Push notifications. + Add form – since a particular agreement form is linked with a particular recipient group, select many agreement forms to address many recipients on different URL addresses. 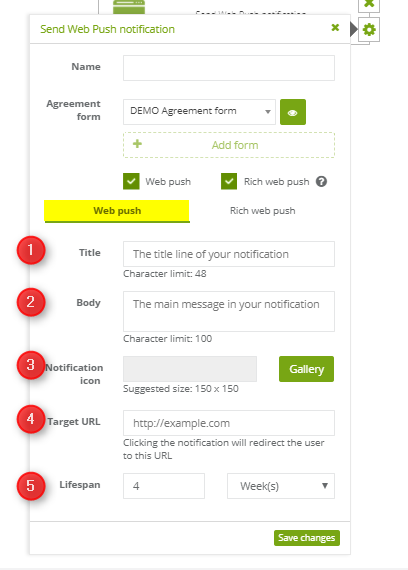 Select the notification type you want to send – Web Push or Rich Web Push. You can select both options, then, in case a user’s browser does not support Rich Web Push notifications, the Web Push notification is sent. Next, you have to adjust the notification settings. Title – the first line of your notification. Up to 48 characters. Body – the main content of your notification. Keep it short. Up to 100 characters. Notification icon – select a small picture from the Image gallery to be used in the notification. The following file formats can be used as icons: JPG, PNG, WebP, ICO/CUR, and BMP. The GIF format is not supported by browsers. The suggested icon size is 150 x 150 px or less. Larger images will be scaled down to fit. TIP: Use square icons whenever possible. if you select an image in a shape different than a square, the image will be automatically adjusted to a square shape. This may cause it to lose proportions. Lifespan – the time after which the notification expires. When a notification is sent but not delivered, a timer tracks how old it is, letting you decide when the notification should no longer be displayed. 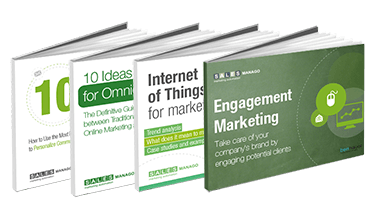 Consider setting a short lifespan for notifications that are relevant only within a specific timeframe. For example, a special offer might run 11th – 13th July and if you’re sending a notification to spread the word, the notification’s lifespan should not extend beyond the 13th. Title – enter the notification title. Up to 45 characters. Notification icon – upload a graphic to be displayed next to the title. The following file formats can be used as icons: JPG, PNG, WebP, ICO/CUR, and BMP. The GIF format is not supported by browsers. The suggested size is 150×150 px. Notification image – upload a main graphic of the notification. The following file formats can be used as icons: JPG, PNG, WebP, ICO/CUR, and BMP. The GIF format is not supported by browsers. The suggested size is 360×240 px. Target URL – add a URL address, so it can redirect users to a dedicated landing page or a product page. Lifespan – the time after which a notification expires. When a notification is sent but not delivered, a timer tracks how old it is, letting you decide when the notification should no longer be displayed. The time is calculated from the moment the condition is fulfilled. When you’re done, click Save changes.